In And Another Thing. . . the outspoken and outrageous presenter Jeremy Clarkson shares his opinions on just about everything. Jeremy Clarkson finds the world such a perplexing place that he wrote a bestselling book about it. Yet, despite the appearance of The World According to Clarkson , thingsC\u0002B\u0017amazinglyC\u0002B\u0017havent improved. Not being someone to give up easily, however, hes decided to have another go. In And Another Thing. . . the king of the exasperated quip discovers that bombing North Carolina is bad for Yorkshire, we can look forward to exploding at the age of 62, Russians look bad in Speedos (but not as bad as we do), and that wasps are the highest form of life. Thigh-slappingly funny and in your face, Jeremy Clarkson bursts the pointless little bubbles of the idiots while celebrating the special, the unique, and the sheer bloody brilliant . . . And Another Thing. 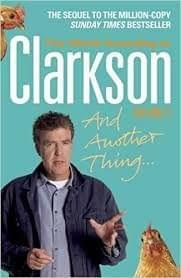 . . is a hilarious collection of Jeremys Sunday Times columns and the second in his The World According to Clarkson series, which also includes For Crying Out Loud! , How Hard Can It Be? , and The World According to Clarkson.